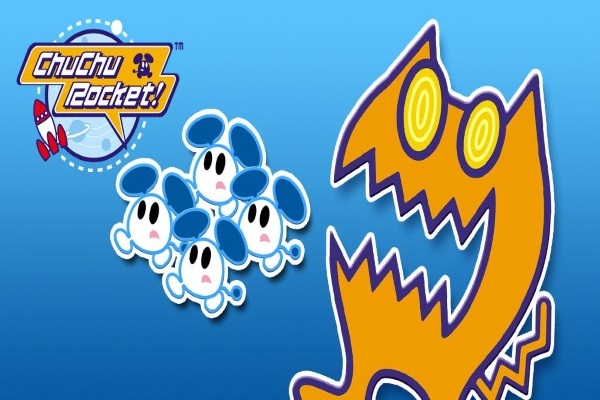 Home VgamerZ OriginalZ Retro Corner: ChuChu Rocket! If the Dreamcast is known for anything, it’s the unique library of weird-tastic weirdly weirdery. During its fleeting life, it brought us such delights as Jet Set Radio and the utterly demented Seaman. Among these, the highlight was probably the oh-so-Japanese party game ChuChu Rocket! Hold on to your underpants, we’re taking a look now. Like all good party games, this little slice of madness starts with a rather simple concept. It then injects a heaping helping of hyperactivity and chaos to proceedings, just the way we like it. In this case, you’re charged with placing arrow tiles on a game board to direct a band of space-mice (the titular ChuChus) into a rocket. They run automatically straight forward, and take right turns when encountering a wall, so your ‘aiming’ skills are crucial to success. As do their sworn enemies, the cutesy/demonic-looking KapuKapus (space-cats). Essentially, then, your objective is to balance directing the mice to your own rocket while propelling furious cats of claw-y justice toward your opponents. The latter will sap their score, as a KapuKapu that reaches a rocket will eat one third of the collected mice inside. ChuChu Rocket! is replete with game modes, sporting single player options and multi. The local play, both co-op and competitive, is the highlight, and where the bulk of the frantic action is to be found. Doesn’t look too crazy, you say? Wait until you play it. 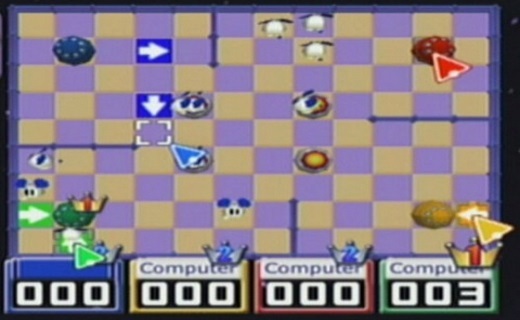 Each player has their own coloured rocket in their corner of the screen. Mice will emerge onto the board from designated areas, and you have to coerce them your way. Control is simple enough, with each different direction corresponding to an arrow tile (depending on where you want the little guys to go, naturally. It is chaotic simply due to the amount of ChuChus on the screen at once, and the contradictory arrows being placed by four players at once. It’s a game of one-upsmanship, which sees you vying for certain spots on the board. Special bonus mania modes, which ramp up the mice count and the game speed simultaneously, add to the madcap fun. It’s the kind of good-natured friendship destroying play you see in party classics such as Mario Kart and Mario Party. When you demolish a player’s score in the dying seconds by sending a volley of cats into their rocket, all hell will break loose. This is the kind of thing local co-op was made for. Meanwhile, the lone player can enjoy a distinctly different experience. Here, puzzle mode awaits. This is a series of stages challenging you to rescue a set amount of the ChuChus with a strict time limit. There’s a vast array of variants on the theme, and it all makes for a uniquely brilliant package. ChuChu Rocket! is also notable for being the first major console game with online support. It was as half-assed and ropey as you’d expect, but it was there. Huzzah!